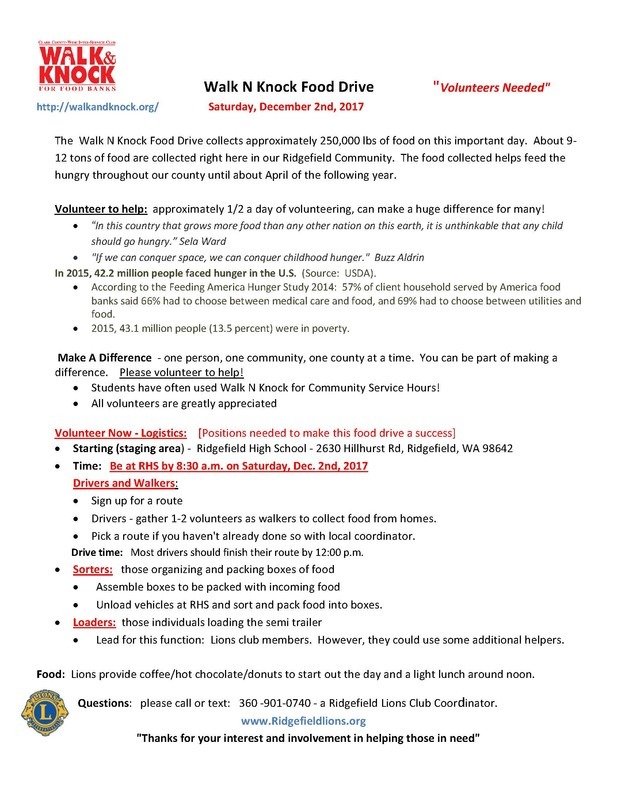 Volunteer to help with Walk & Knock, Clark County’s annual food drive, on Saturday, December 2nd. All it takes is a half-day of your time but you can make a huge difference for many. Walk & Knock is one of the nation’s largest one-day food drives and takes place each year on the first Saturday of December. It solicits charitable donations of food, which is given to the Clark County Food Bank for those in need across our community. Drivers and walkers to collect food from homes along a specified route. Sign up for a route with the Ridgefield Lions Club Coordinator (see below). Sorters to sort food and pack them into boxes. Loaders to help load boxes into semi-trailers. If you’d like to help, meet at Ridgefield High School, 2630 S. Hillhurst Road, on Saturday, December 2nd at 8:30 am. All volunteers are greatly appreciated! For more information, call or text the Ridgefield Lions Club Coordinator at 360-901-0740. You can also visit the Walk & Knock website at http://walkandknock.org .